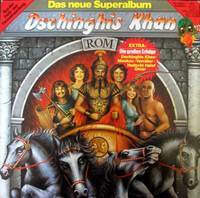 For several years, I've had an LP cover by the 1970's German disco band Dschinghis Khan gracing the cover of my DJ locker at WFMU. So imagine my surprise when Bryce mailed me this music video (mpeg video file) of the band doing a fantastic cheesy cossack disco dance number! And then when Nachum Segal saw my Dschinghis Khan LP this morning, he screams, "Dschinghis Khan, they're huge in Israel!" And then Nachum send me even more Dschinghis Khan videos. Why does Israel go crazy for bands like Dschinghis Khan, Baccara and t.A.T.u.? (MP3s) Why do I?